SAN NARCISO, Calif. (Bennington Vale Evening Transcript) -- George Zimmerman, in a frightening change of circumstance, found himself on the business end of a pistol Monday. The incident occurred during a near-deadly bout of road rage, sparked when the former neighborhood watch volunteer waved a firearm at a man in another vehicle. The shooter, identified as Matthew Apperson, had previously had a run-in with Zimmerman back in September 2014. During that confrontation, Apperson suffered an unprovoked assault by Zimmerman, who accused him of shaking a finger at his truck. 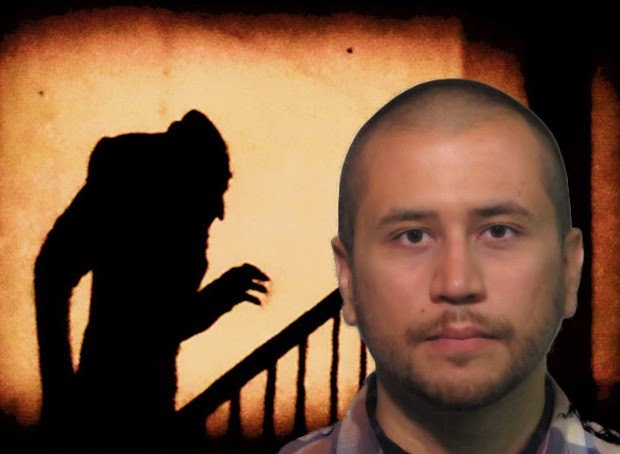 Perceiving the digit-wagging as a grave threat to his life -- one perhaps more perilous than an unarmed black teenager brandishing Skittles and iced tea -- Zimmerman cautioned the would-be assailant that he would “f***ing kill” him. This event, one in a growing string of encounters with police, reveals a more complex view of Florida’s Stand Your Ground law than the media portrayed during the Trayvon Martin hearings: mainly that someone as paranoid and terrified of everything as George Zimmerman needs “shoot-first” type protections. Zimmerman rapidly became the public face of Stand Your Ground, influencing the outcomes of similar cases. In January 2014, for example, retired police captain Curtis Reeves, 71, shot and killed a man in a Florida movie theater. Reeves confronted 43-year-old Chad Oulsen about sending text messages on his mobile phone during the previews before the main feature. As the argument escalated, Mr. Oulsen allegedly threw popcorn at Reeves, instigating an armed response. Reeves was charged with second-degree murder, although legal experts predicted he would invoke Stand Your Ground to justify killing a man equipped with only popcorn. One year later, however, the court refused to allow the Stand Your Ground defense because the victim had been white. Regardless, as the National Rifle Association (NRA) points out, George Zimmerman’s acquittal under the “Skittles Defense” validates the idea that anything -- even confections and snack foods -- can pose serious threats to the population. The NRA has since added popcorn to its list of “deadly assault snacks,” along with Swisher Sweets cigars, which caused a Ferguson, Mo., police officer to empty his service revolver into the back of Michael Brown, an otherwise unarmed African American, for putting his life at risk with secondhand smoke. When questioned by reporters in March, shortly following the anniversary of Trayvon Martin’s killing, Zimmerman said that he maintained a clear conscience about murdering the boy, which he described as part of God’s plan -- a plan emboldened by laws popular with religious conservatives, such as Stand Your Ground. In fact, only through a preordained, divine purpose could Zimmerman’s ongoing series of armed confrontations and subsequent exonerations make any sense, coincidence seeming a preposterous explanation otherwise. But despite his myriad detractors, Zimmerman is a hero. By constantly revealing the infinite fears that beset humankind, Zimmerman shows us how we can overcome and conquer adversity -- frequently through paranoia and justifiable homicide. In July 2013, Texas police stopped Zimmerman for speeding. Zimmerman told the officer he had a legal firearm in the glove compartment and that he had killed an unarmed black teen in Florida. The officer naturally let Zimmerman go with a warning. In August 2013, a Florida Highway Patrol trooper pulled Zimmerman over because his windows were too darkly tinted and his tag covers were illegal. Zimmerman told the trooper that he feared the steely gaze of strangers, and that they might gesture at him (ominous foreshadowing of events to come). He was again released with a warning. In September 2013, Zimmerman’s estranged wife Shellie called police to report that George had smashed her iPad, threatened her with a gun and attacked her father. According to Mark O’Mara, Zimmerman’s attorney, units responded to protect George from Shellie, whom he described as the aggressor in the incident. Officers promptly sheltered Zimmerman in their patrol car upon arrival. Shellie later recanted parts of her story, and no charges were filed. In November 2013, police in Seminole County arrested Zimmerman after his new girlfriend accused him of pointing a shotgun at her, smashing a coffee table and locking her outside. Again, Zimmerman explained that something had filled him with utter terror, necessitating the aggressive response. In this case, hostility was roused by the presence of Chex Mix; his girlfriend had purchased a bag that day for a party. Fortunately, reason and clearer minds prevailed yet again. All charges of aggravated assault, battery and criminal mischief were justifiably dropped. Apperson claimed that had been listening to music with his windows rolled up at the time, and that the incident was unprovoked. But Apperson’s gesticulations were clearly a threat Zimmerman knew well, as evidenced by his August 2013 excuse for unlawfully tinted windows and covered tags. Zimmerman then asked Apperson, “Do you know who I am?” according to a police report. Apperson described this question as a form of intimidation and bravado, but given Zimmerman’s history and absolute fright, police believe he was trying to determine whether Apperson was targeting him. Apperson continued to act evasive, which prompted Zimmerman to take action and warn his potential assailant that he would be forced to “f***ing kill” him, under Stand Your Ground. True to form, Zimmerman appeared to be stalking his suspect two days later. Apperson, after noticing Zimmerman’s truck parked outside his office, phoned police. Officers who responded to the call confirmed the truck driver was Zimmerman. Video footage from the patrol car’s camera showed two police officers questioning Zimmerman, with one removing a gun from Zimmerman’s waistband. Zimmerman then produced what appeared to be a license. Zimmerman and Apperson parted ways without incident or charges being filed. Flash forward to May 11, 2015. George Zimmerman, hero, is traveling through the peaceful streets of his community, en route to a doctor’s appointment. And there’s Apperson. The reflexes of instinct twitch. History repeats itself. The fear takes hold. However, this time, the fear is flowing both ways. Zimmerman, knowing Apperson is a possible criminal intent on disrupting the neighborhood, unholsters his weapon and signals a warning. Apperson -- believing that he’d been threatened, followed and stalked by Zimmerman last year -- now invokes Stand Your Ground by pumping off a single round into Zimmerman’s vehicle, barely missing his head. The bullet instead shatters the passenger side window, sending shards of glass flying into Zimmerman’s face.